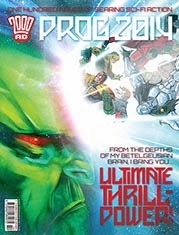 Tharg collects a gathering of stories from the 2000AD Universe in an oversized issue of the sci-fi anthology comic, ranging between one-shot stories and introductions to storylines in the main series. This one came out a little bit ago, but I wanted to hit it up for review because it serves as a great way to get on board with the main anthology series. It can be a bit intimidating jumping on to an anthology series that rotates ongoing stories. I know I've felt that way myself with Shonen Jump, for example, and once I fell away from Shojo Beat I wasn't able to climb back on because the stories were so far advanced. But speaking as a person who's recently come to see just how strong the stories from 2000AD are, I'd encourage you to give it a shot. They aren't lying when they say they are science fiction comics. When you move past Judge Dredd (but make sure you read it first, because Dredd is arguably the best character I wasn't reading until this past year), the back stories are all grounded in the kind of speculative fiction that I love when I read it in prose: Grounded firmly in genre concepts and ideas with characters who do interesting things. Carroll's dialogue is sharp and full of acidic remarks, especially from Dredd. The plot is fast-paced and gives readers--especially new ones--a good sense of the world, with the help of Leigh Gallagher's extremely detailed artwork. Gallagher draws almost every piece of detritus in the junkyard, then turns those skills to add little touches in the crowd scenes, like putting reverse cross-eyes on a cat shirt or the bends in a side character's dreadlocks. It's a great one-and-done intro to the Judge Dredd universe and is a highlight of the issue. 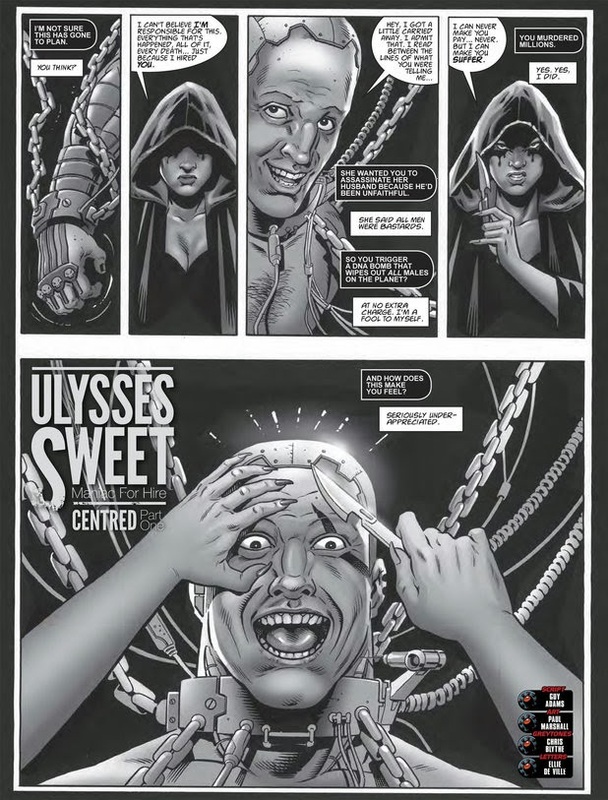 Next up is the start of a Ulysses Sweet story that had me pausing to laugh out loud several times. Lobo looks like a monk compared to this guy, whose clients end up dead so often his bounty hunter agent says he'll killing him--to which Sweet immediately asks, "You want me to kill you?" while sipping a martini-like drink. Comedic moments like this abound, as writer Guy Adams provides straight man after straight man for Sweet, including an implanted AI that's supposed to keep him in check but fails miserably. There's only a small amount of mayhem, but the verbal gags are Giffen-Dematteis-in-their-prime funny. Paul Marshall, working in black and white, plays it pretty straight with the visuals, but gets in an awesome Liefeld-esque gag in himself at the end. This one blew me away with just how funny and engaging it was and I'm looking forward to reading more Sweet stories in the regular anthologies. Rob Williams and Edmund Bagwell present a The Ten-Seconders story that assumes some pre-knowledge on the part of the reader, but once you get past that, the idea of a man whose singular desire keeps him alive in a vast war for power comes through, along with a few nice comedic bits that feel prototypically British to me. I left it wanting to know more about this world, which hints at vast devastation and epic battles. Anyone who was already following gets a touching story about coming home. ABC Warriors is another starting point story, with robots able to handle the kinds of warfare that humans cannot. They gather together in ways unexpected by their creators, as we flash back to past events that set the stage for a war that looks to have left only the robots still standing. 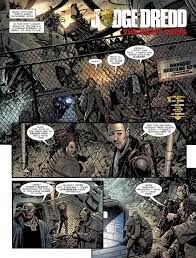 Pat Mills' script is a bit overwrought in places, with dialogue that feels drawn from familiar war and cyborg stories. However, the hyper-realistic art from Clint Langley uses digital processing quite well to create fog, weathering on the metallic protagonists, and other tricks that put this above the usual fare. ABC Warriors is military sci-fi, which is not really my thing, but might be yours, in which case, you're in a for a treat. Back to another series that's in the middle, Sinister Dexter, Dan Abnett pits a small group of people against a universe-level threat, as a cop breaks rules and trusts those she'd normally bust. The premise is familar, but Abnett gives it his own spark of life with engaging characters who do not seem like they're up to the task. There's some things not being told (possibly because they already were), but there's enough here to keep me interested, because I want to see just how these misfits save the day and sometimes it's fun just to read a thriller with "bits and bobs" like references to cats plotting against their owners. PJ Holden's linework helps a ton here, with character designs that are just a bit off-kilter and quirky. They're slightly exaggerated, which fits Abnett's plot well. I also liked his panel choices, such as alternating between having the hero and his attacker facing the reader and vanishing points that highlight the biggest moment in any scene, whether it's a weapon or a character reaction. I'd like to see more of this one, too. Absalom moves back to black and white work, telling the story of futuristic cops who appear to be easily corrupted. When one of the (kinda) good ones has his family's safety on the line, however, he'll go to the man he replaced to save them. This story is clearly meant to be a recap because of the length of time between installments, and it's a good one. I was instantly hooked by this world, which is a futuristic, horror-filled noir--in other words, "Hey, Rob, here's a story we wrote just for you." It's things like Absalom that make me wish I'd been reading 2000AD years ago. Gordon Rennie and Tiernen Trevallion just absolutely kill it on this one. The characters are dark and desperate, but you want to root for them. Magic and darkness clearly play a part, and we see that prices must be paid. 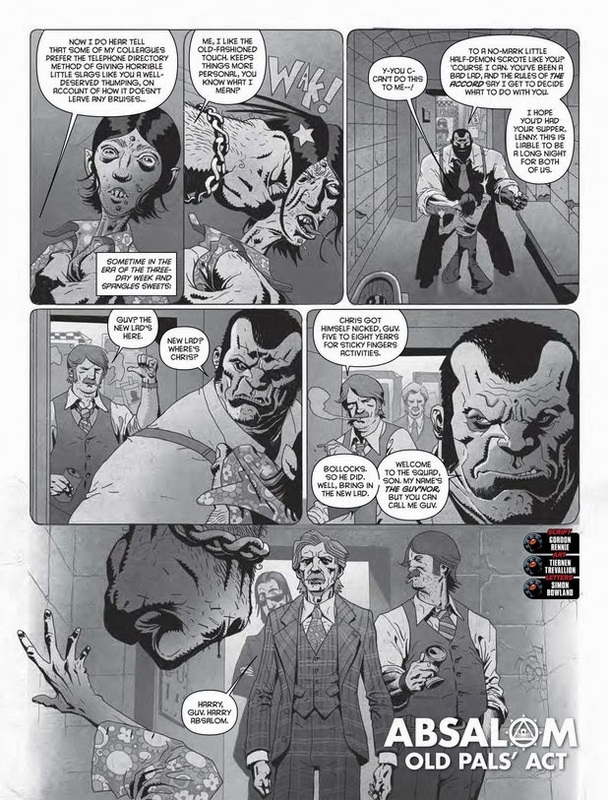 Trevallion's art is heavy on inks and angular lines, not unlike Eduaro Risso, and it gives the world of Absalom a grime that covers everyone in it. Just spectacular stuff. Grey Area is Abnett's second story in this collection, in which Planet Earth is a big enough intergalactic tourist destination that it has a holding area for its many visitors. The story is told from the perspective of a potential tourist who gets shown around the area as it awaits approval to leave the zone. There's a lot of gags and jokes involving the bureaucracy, with the alien visitor only seen as hands holding different objects he needs to go from station to station. It's a clever way for Abnett to introduce the concept, and artist Patrick Goddard sells it with the bored look on the employee faces and the periodic cool alien. The linework is pretty standard, but it does the job, letting Abnett do the heavy lifting in this prologue piece. Ever wonder how a comic book is made? Well, I'm pretty sure that "Building a Better Comic" is 100% true, as Tharg get a spotlight satirizing the comic industry, turning the creative staff into robots who bow at the whim of their publisher, Tharg himself. There's references to everything from self-inking "to follow through on artistic vision" (Tharg with five breasts) to a letterer fretting about how many words are in the script. Even distribution isn't safe from the gags, and writer TMO also gets a jab in at digital readers, too (thanks for thinking of us!). Anthony Williams knows just how to make a joke work, and it was nice to see the creative staff wasn't portrayed as 100% male. This self-parody in the tradition of many a Marvel comic was a lot of fun to read. The only one that didn't work for me at all was Strontium Dog by John Wagner and Carlos Ezquerra. A military mash-up with mutants, topical references to drones, and filled with unpleasant people, it just didn't register with me. This felt like something Garth Ennis might write, and for those who like that style, it's probably great. Just not for me.